Super Eighties is a video slot developed by NetEnt. Even though the game is designed to take us all back to the wild eighties, symbols, effects and animations are modern. Futuristic design with 3D graphics can be seen very often at the games developed by the NetEnt company. The firm was established back in 1996, along with all the other major companies from the online gambling industry. Even though some of their competitors had previous experience in the land casino game development department, NetEnt created some of the best games on the market. Each line can be activated or de-activated by the player, making the entire span of lines optional. Gamblers combine the number of lines with the bet level, in order to get the final stake. The minimum possible stake takes only 1 coin, with the value set at $0.01. The maximum, on the other hand goes up to 200 coins with value topping at $0.50, making it $100.00. 95% of all the gamblers never gamble more than $100 per spin , but if you belong to the super high-rolling part of the community then check out the Steam Tower slot, developed by NetEnt as well. The game also includes a massive jackpot reward, which makes it appealing to the low-bettors and casual gamblers as well. Online slots cannot be popular if they do not include free spins. Even though companies are implementing unique and exciting features, coming up with brilliant ideas constantly, gratis roll feature is something that needs to be included. In order to activate the addition, players need to catch 3 scatter symbols at any position in the 3 middle reels. As there are 4 rows, this task becomes much easier compared to the ones with only 3. 12 Fields in total may contain the scatters. Gamblers who land all 3 scatters are awarded 5 costless swirls. Even though this number seems to be under the average, landing 3 more scatters results in 5 additional free rolls. Keep in mind that all winning combinations throughout the feature are doubled. Not only that additional scatters increase the amount of gratis spins, they also reward x2 of the initial bet instantly. Even though the gamble feature is not implemented in Super Eighties slots, all wins are accumulated and added to the total balance at the end of the feature. Gaming online for free is all about having fun and exploring different games and features, but switching to the real version is where it becomes more serious. 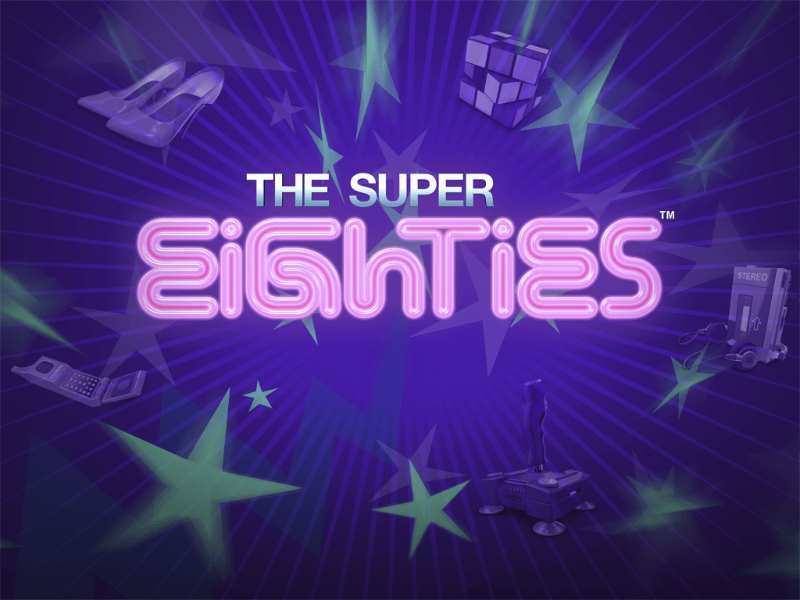 Super Eighties online is available at any casino in both versions. Make sure to check the bonuses & promotions page at least once a day, as some promotions last for only a few hours or for a few days. These are extremely valuable, as registered and active users are the only ones who can find out about them. Getting free spins in the real money mode is something to look for, as spinning for 50, 100, 150 or even more times may result in huge winnings, especially if you manage to win the jackpot. No download is required in order to play for real, and all devices are welcome. Mobile phones, tablets, PC’s, laptops and other devices all provide the same features, promotions and options. If you are looking for any kind of referral promotions, it is recommended to search for codes, as you can simply copy and paste them at the casino. Links are often leading to suspicious websites, resulting in viruses, malware and ruined devices. Last but not least, the payout can be requested through several payment methods. The most popular one in the UK is the Ewallet method. The only one that has lower fees and takes less time to process is Bitcoin. 0 responses to "Super Eighties Slot"